After the laundry room makeover, my cousin and I moved on to the other large project in her house -the kitchen. The kitchen had white cabinets, which was nice, but they were bland. No trim at all. The kitchen was open to the dining room, which was also nice, and the dining room walls were a soft, sage green with white trim. I liked the color and the paint was fairly new so it didn't have to be repainted. 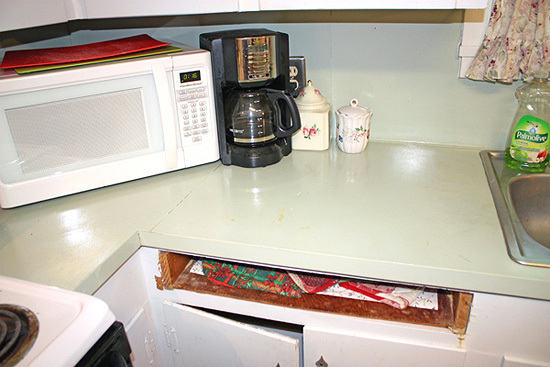 The big problems in the kitchen were the countertops, backsplash, and the bland cabinet doors. 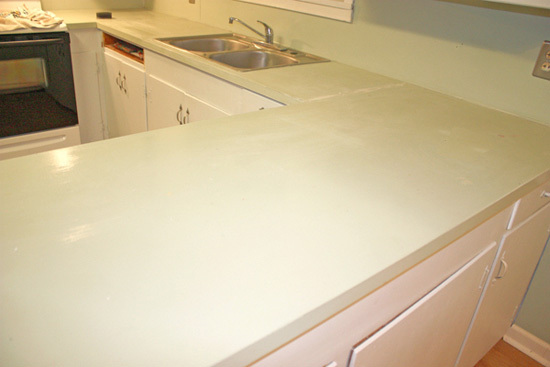 An attempt to update the countertops had been done; they were painted the same sage green. Ditto the backsplash! Having the walls, countertops, and backsplash all the same color made the kitchen look dated and a little cheap. We decided to start with the countertops. I looked at all the options available. Replacing them with pre-made countertops was going to be too expensive. Obviously, stone would be really expensive, and she didn't want to use tile. That left re-painting them. 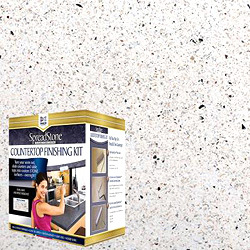 I looked at all the different types of countertop paints. Most required an artist's eye and the ability to make several layers of paint look like stone. At $150 these kits weren't really cheap, and if you didn't have the knack to make it look good then the money would be wasted. I finally came across a product I thought had the greatest chance of success. The product is by Daich and is made to imitate a soapstone. According to the video you can watch, you simply roll on a base coat of paint, roll on 2 layers of the rock chips, and then roll on 2 protective topcoats. No artistic design needed. There are 6 or 7 different colors to choose from; we choose this one called "Natural White". It isn't a bright white, but a soft off-white. I ordered one kit from Home Depot, and was pleased that it came in two days earlier than estimated. 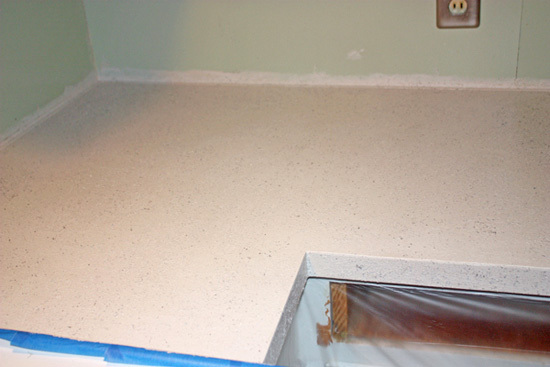 These are the countertops we started with. (Yes, that drawer front is missing, but that gets done another day). The first thing we had to do was sand the countertops to remove the shine. Then patch any cracks. 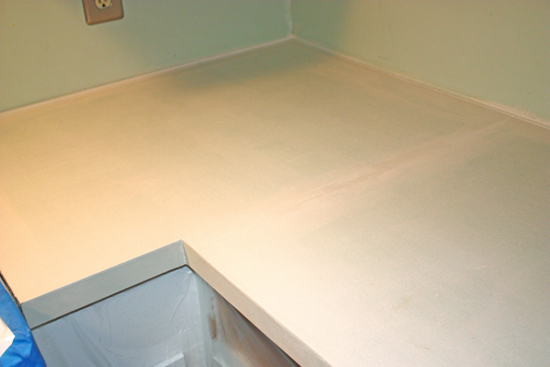 As the surface of the countertop was the original late '60's formica, there were cracks! We filled them with spackle and then sanded it smooth when dry. We also tapped off anything we didn't want painted and covered the sink and faucet with plastic. We planned to re-do the backsplash so it wasn't covered. It was time to break out the kit! I was a little nervous as I had never tried this before and it cost $125 for the kit (and it wasn't my house). We rolled on the base layer of paint. It was very easy to do, a little thicker than standard paint; more like pudding. However, it rolled on easily and smoothly with no overlap lines. It also dried beautifully. On to the stone layer. We found that having one person roll on the stone and the second person coming behind and moving the stone around with a plastic putty knife worked really well. The stone could easily be moved around so that it was spread out evenly. 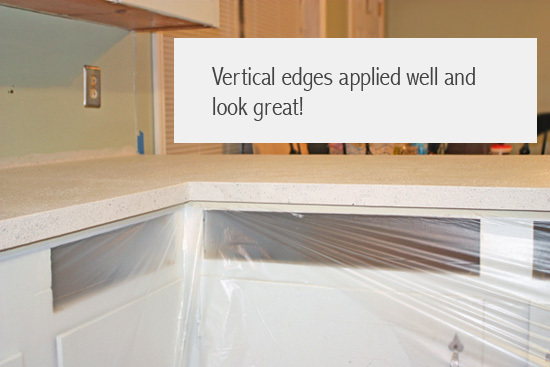 It was also very easy to apply to the vertical edges of the countertop. We applied 2 coats of stone with drying time in-between. We let it dry overnight and sanded it the next day. We preferred a slight texture rather than a slick, smooth finish so the sanding didn't take a lot of time. After applying 2 layers of topcoat, we were done! I will say that this was very easy and it looks just the way it is advertised! No special painting techniques, no special skills. 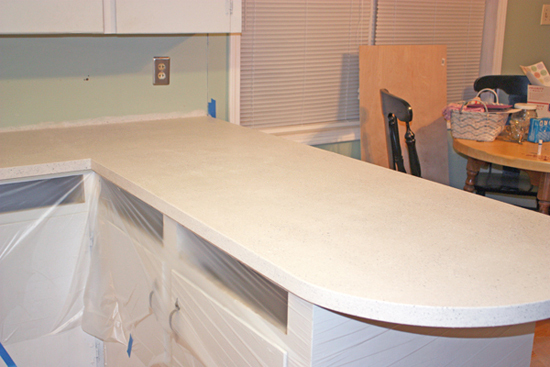 It has been 6 months since this was done and the countertops are still beautiful and look the same as the day we finished! 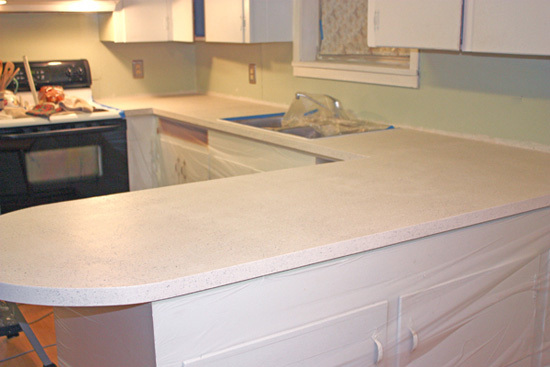 I am very pleased with this product and the kitchen countertops look great. Since we left a slight texture they also have the "feel" of stone. The countertops made a huge difference in the kitchen. Of course, we aren't done yet. We'll move on to the cabinets and backsplash next.